As is well known, perhaps one of the most controversial, often even acrimonious (Levy 2003), splits in modern Western philosophy is the one between the so-called “analytic” and “continental” approaches. Even though lately the fashion in philosophical circles is actually to deny outright that there is any meaningful distinction to be made in this context, I think to ignore this aspect of modern philosophizing would do a disservice to the field and to its practitioners. And as it will soon be clear, plenty of people keep making interesting comments on the analytic-continental distinction even though it allegedly does not exist (e.g., Mulligan et al. 2006). To simplify quite a bit, the split has become apparent during the 20th century, though it can be traced back to the immediately post-Kantian period (with Kant himself often depicted as straddling the two traditions). Analytic philosophy refers to a style of doing philosophy characteristic of the modern British empiricists, like Moore and Russell, with an emphasis on argument, logical analysis, and language, and it is what one finds practiced in many (though by no means all) philosophy departments in the United States and the UK. Michael Dummett (1978, 458) famously said that the “characteristic tenet [of analytic philosophy] is that the philosophy of language is the foundation for all the rest of philosophy … [that] the goal of philosophy is the analysis of the structure of thought [and that] the only proper method for analysing thought consists in the analysis of language.” However, Cooper (1994) rightly points out that this is only partially helpful when it comes to distinguishing analytic philosophy, especially in the light of recent developments, such as the rise of “analytic metaphysics” (Chalmers et al. 2009). Continental philosophy — the name deriving from the fact that historically its leading figures have been German or French thinkers — is seen as a more discursive, even polemical, way of doing philosophy, often characterized by a not entirely transparent way of presenting one’s ideas, and more concerned with social issues than its analytic counterpart (though, again, there are plenty of exceptions). There are two questions that concern me here: how can we understand the nature of the split and what it says about philosophy in general? And to what extent is some of what is going under the heading of continental philosophy sufficiently different from the core discipline and its tools that we might want to think of it as a different type of activity altogether? Richard Rorty (1991, 23) famously answered the second question somewhat categorically, foreseeing a day when “’it may seem merely a quaint historical accident that both bear the same name of ‘philosophy.’” I’m not so sure. 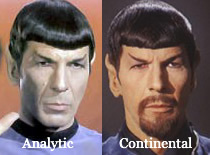 Perhaps the first thing that becomes obvious when comparing analytic and continental works is their difference in style. As Cooper (1994) puts it, “We know where Quine or Derrida belongs, before grasping what he is saying, from the way he says it.” Levy (2003) characterizes continental philosophy as more “literary” as opposed to the (allegedly) clearer but more rigid analytic approach. As we shall see in a moment, this difference in style also points toward a deeper division between the two modes of doing contemporary Western philosophy: one more “scientific” (and science-friendly), the other more humanistic (and often critical of science). Another consequence manifests itself in the type of work produced in the two traditions, as well as in the makeup of their intended audiences: with the usual caveat that there are a number of exceptions, analytic philosophers increasingly prefer scholarly papers to books (as do scientists, nowadays), and aim them primarily at a very restricted set of specialists; continentalists, by and large, prefer books which, at least to some extent, are meant to engage the general educated public, not in the sense of being introductions to philosophy, but in that of fashioning the philosopher in the role of a cultural critic with broad appeal. The three themes identified by Cooper are: cultural critique, concern with the background conditions of inquiry, and what for lack of a better term he calls “the fall of the self.” Cultural critique is perhaps the chief activity continental philosophers are associated with in the mind of the general European public, particularly in France (think Foucault and Derrida). This it is the sort of thing that relatively few analytical philosophers dabble in, and when they do — as astutely observed by Cooper in the case of Bertrand Russell and his social and anti-war activism — it is in an “off duty” mode, as if the thing had little connection with their “real” work as philosophers. As far as the second theme is concerned, both analytic and continental philosophers are preoccupied with the conditions for inquiry and knowledge, but from radically different perspectives. As I shall elaborate upon below, philosophy of science (which is for the most part firmly planted in the analytic tradition) approaches the issue from the point of view of logic and epistemology, with talk of logical fallacies, validation of inferences, testability of theories, and so on. On the other side we have “science studies,” a heterogeneous category that includes everything from philosophy of technology to feminist epistemology, with more than an occasional dip into postmodernism. Here the emphasis is on science as a source of power in society, on the social and political dimensions of science in particular, and on the construction of knowledge in general. The third of Cooper’s themes — the “fall of the self” — is also shared by the two traditions, in a sense, but again the two approaches are almost antithetical. Analytical philosophers generally tend to have a deflating if not downright eliminativist attitude toward “the self,” dismissing outright any form of Cartesian dualism as little more than a medieval superstition, and in some cases arriving at what some of them think is a science-based conclusion that there is no such thing as “the self” or even consciousness at all, yielding something that looks like a strange marriage of cognitive science and Buddhist metaphysics. Continental philosophers do not mean anything like that at all when they talk about the self, the death of the author, or the death of the text — though what exactly they do mean has in many instances been more difficult to ascertain. For Cooper these three thematic differences are in turn rooted into a fundamental difference of philosophical mood: to put it a bit simplistically, analytic philosophers are sons (and daughters) of the Enlightenment, and they are by and large very sympathetic toward the scientific enterprise, even to the point of using it (wrongly, I will submit later in the book) as a model for philosophy itself. Just consider Russell’s (1918) classic essay, “On the scientific method in philosophy.” Continentalists, on the contrary, tend to be markedly anti-scientistic (in some cases, to be honest, downright anti-science), and are instinctively suspicious of claims of objective knowledge made by cadres of experts. Just think of Foucault’s (1961) classic work on madness. From the continental point of view, philosophers of science like Popper (1963) are hopelessly naive when they look (and think they find) logical rules that can determine the validity of scientific theories, and authors in the continental mode would argue that too much emphasis on a scientific worldview ends up discounting the human dimension altogether — ironically, philosophy’s original chief concern (at least according to Plato). Indeed, if one reads, say analytical philosopher Alex Rosenberg’s (2011) The Atheist Guide to Reality one is cheerfully encouraged to embrace nihilism because that’s where fundamental physics leads to (in his opinion). Imagine how Camus would have reacted to that one. Cooper’s analysis also provides the point of departure for Levy’s, which leads the latter to add an interesting, if in my opinion debatable, twist. Somewhat ironically, Levy uses Thomas Kuhn’s (1963) ideas on the nature of science as a way to separate the analytical and continental modes of philosophizing. I say ironically because Kuhn is claimed to some extent by both camps: among philosophers of science (analytic) he is credited to have been the first to take seriously the historical-cultural aspects of science, not just the logical-formal ones. From the perspective of science studies (continental) he is associated with having dismantled the idea of objective progress in science, an “accomplishment” he himself vehemently denied. Levy’s idea is that analytic philosophy has modeled itself as a type of activity akin to Kuhn’s “normal,” or “puzzle-solving,” science, i.e. science working within an established paradigm, deploying the latter to address and resolve specific issues. The paradigm Levy has in mind for analytic philosophy is chiefly the result of the works of Frege and Russell, i.e. an approach that frames philosophy in terms of logic and language. As in normal science, analytical philosophers therefore specialize on highly circumscribed “puzzles,” and Levy is ready to grant (though he leaves the notion unexplored) that such philosophy makes progress — in a way similar to that, say, of evolutionary biologists working within the Darwinian paradigm, or physicists operating under the Standard Model (sans the empirical data as far as philosophy is concerned, naturally). However, this depth of scholarship inevitably trades off against an inability to address broadly relevant issues (just like in normal science, according to Kuhn). That’s where — in Levy’s analogy — the contrast with continental philosophy becomes evident. The latter functions rather in a perpetual state of Kuhnian revolution, moving from one paradigm to the other (presumably, without ever experiencing significant periods of puzzle-solving in the middle). In a sense, argues Levy, continental philosophy models itself after modernist art, where the goal is not to make progress, at least not in the sense of gradually building on the shoulders’ of previous giants, but to completely replace old views, to invent fresh new ways of looking at the world. The trouble with this model, as Levy himself acknowledges, is that it makes the two philosophical modes pretty much irreconcilable: “If this [view] is correct, we have little reason to be optimistic that AP [analytic philosophy] and CP [continental philosophy] could overcome their differences and produce a new way of doing philosophy that would combine the strengths of both.” But perhaps such pessimism is a bit hasty. Let us consider one possible way in which the two traditions may be merged into a third way that emphasizes the strengths of both and minimizes their respective weaknesses. We are, of course, talking about philosophical mood, not the psychological profiles of the individuals involved — though that would perhaps be an excellent topic of research for experimental philosophers. Chalmers, D., Manley, D. and Wassermann, R. (eds.) (2009) Metametaphysics: New Essays on the Foundations of Ontology. Oxford University Press. Cooper, D.E. (1994) Analytical and continental philosophy. Proceedings of the Aristotelian Society 94:1-18. Dummett, M. (1978) Can analytical philosophy be systematic, and ought it to be? In: Truth and Other Enigmas. Duckworth. Foucault, M. (1961 / 2006) History of Madness. Routledge. Kuhn, T. (1963) The Structure of Scientific Revolutions. University of Chicago Press. Levy, N. (2003) Analytic and continental philosophy: explaining the differences. Metaphilosophy 34:284-304. Mulligan, K., Simons, P. and Smith, B. (2006) What’s wrong with contemporary philosophy? Topoi 25:63-67. Popper, K. (1963) Conjectures and Refutations: The Growth of Scientific Knowledge. Routldedge. Rorty, R. (1991) The Priority of Democracy to Philosophy. In: Objectivity, Relativism, and Truth. Philosophical Papers, Volume 1. Cambridge University Press. Rosenberg, A. (2011) The Atheist’s Guide to Reality: Enjoying Life without Illusions. W.W. Norton & Company. Russell, B. (1918) On the scientific method in philosophy. In: Mysticism and Logic and Other Essays. Longmans, Green and Co. This entry was posted in Nature of Philosophy on April 20, 2016 by Massimo. The last two articles have been interesting and engaging. I just haven’t had a lot to say on them. But I would say that I don’t particularly want analytic and continental philosophy to merge. I’m quite happy to see them continue to diverge, because personally I have next to no interest in continental philosophy and a great deal of interest in analytic philosophy. But if I subscribe to philosophy podcasts or join philosophy clubs or whatever I am exposed to a lot of stuff that is just meaningless to me. It’s as if one cannot be interested in English literature without people automatically assuming you are also into Japanese role-playing games. That said, even analytic philosophy can get too abstract and far removed from issues that actually matter. I agree with Russell that analytic philosophy becomes rather uninteresting when it descends into purely semantic questions that have nothing to do with the way things are. It is important to clarify semantics, but only as a means to an end and not an end in itself. Like mathematics, clear language and conceptual analysis are very useful tools which I think are capable of discovering actual truths. This is why the kinds of philosophical issues that most interest me are matters of fact without (as I see it) empirical consequences. Questions like why the universe exists, whether software can be conscious (and if not then what it takes to be conscious), whether there are other universes, whether moral realism is true, whether there is a God, whether libertarian free will exists and so on. I’m less interested in conceptual analysis for its own sake. Per Massimo, the divide isn’t easy today re a few philosophers. Where does one put 20th-century existentialists or absurdists? They do have a humanistic focus, and if Beckett is called a philosopher not just a scrivener, were at least somewhat in the Isles as well as the Continent. And, they certainly don’t write abstrusely, like Heidegger, Derrida, and stereotypical others. I’m a little suprised not that there has been no mention of the classic American pragmatists in this post (especially Dewey). I have been reading a lot of Dewey lately, and he would seem to be a very relevant philosopher with regard to any attempt to find a middle way between analytic and continental thought. In part due to the early influence of Hegel but also his application of his thought across the full gamut (logic, naturalism, epistemology, science, political action, education, art, consciousness, etc….). It is a bit difficult to encapsulate a 2500 year debate, without fully devoting your entire life to it, which sort of defeats the purpose of giving one useful pointers as to how to live one’s life. Knowledge is information. Wisdom is editing. Satre’s novels and plays are very interesting. His philosophy not so much. I’m not sure how much I think the continental-analytic distinction is a useful one to make about contemporary philosophy. Prima Facie it’s definitely a tempting distinction to draw, so I’m not claiming people were crazy for making it! I definitely think it is coherent to talk about an “analytic” movement in philosophy, narrowly defined, though it’s mostly a useful descriptor as a historical description. There is a clear tradition starting with Frege, moving through Russell and many of his British colleagues, the early Wittgenstein and the logical postivists, Quine, the early philosophers of science, and Kripke (among others). However, just because there is some definition of “analytic philosophy” that is probably legitimate, doesn’t mean that the not-analytic western philosophers are a coherent category of people to talk about, beyond them merely not being analytic philosophers. I mean, how much do Marx, Nietzsche, the critical theorists, Derrida, Camus, Deluze, and Heidegger have in common substantively (you might deny the former two are “continental”, and yet they routinely are put under that label)? There may be a more humanistic-style, and a greater emphasis on social issues, and perhaps a greater suspicion of the enlightenment, but on their actual views I don’t see much in common. Furthermore, I think the narrow definition of analytic philosophy I’ve put forward isn’t how the term is used in practice. I’ve heard many people claim figures like John Stewart Mill, the later Wittgenstein and his successors like Anscombe and the ordinary language philosophers, latter-half of the 20th century anglophone ethical and political philosophers, modern-day Kantians, Thomas Kuhn (as you mentioned), analytic metaphysicians, pragmatists, anglophone philosophers of religion, among others, as “analytic philosophers”, and yet it’s not clear to me that they much resemble that narrowly defined tradition that started with Frege and Russell that I outlined in the previous paragraph. Perhaps there are some stylistic resemblances in the writing (though that’s false in at least one case, that of the latter Wittgenstein), but substantively I’m not sure it’s really correct to lump them in the narrowly-defined “analytic” label. For that matter, if all those I listed get to be “analytic philosophers” based on some family resemblances, why aren’t, for example, Husserl or Merleau-Ponty considered “analytic”? It’s not clear to me that they are any further from the narrowly-defined analytics as many of those I listed above are. So, I think “analytic philosophy” might be a legitimate label, but only defined much more narrowly than many self-identified “analytic philosophers” would define it today. I also don’t see continental philosophy as being a useful label. Finally, on purely consequential grounds, I think the distinction has enabled a lot of laziness among contemporary philosophers. While yes, you can’t read everything in philosophy, it seems all too common for philosophers today to use the analytic/continental distinction as an excuse to not engage with a set of thinkers and ideas they’re uncomfortable with. I’ve had “analytic” philosophers openly mock Heidegger and Derrida when it was clear that all they knew of these men’s thought was a few out-of-context quotes and uncharitable summaries by other analytics (I’m sure the reverse happens, too, but I attend a very heavily analytic department). I think deemphasizing it would allow more engagement with a broader range of ideas on both sides, and also allow both sides to maybe learn something from the attitude and style of the other. wow. those comments really diverged from the post topic. I couldn’t read all of them; I think the blog platform is best suited for shorter commentaries, unless your in an active conversation with someone, as it appears some of these comments are. But thats just me; somehow I have a particular anxiousness that develops as I read long treatises online. I don’t know; Im just weird that way. Maybe it because I feel like computers are supposed to be ‘passing’, which is to say, used for quick things, sound bits, discourse bits, etc. Again; Im just weird probably. I had to start scanning once I got about five or six paragraphs down. Its funny how analytical this post seems; not sure, though, which side of the philosophical Pond you are arguing. Or if you are merely putting forth the possibilities of distinguishing them or if its even needed. From what I gathered, I like the ‘puzzle/paper for the specialists’ and the ‘social commentary/books for the masses’ . I think that is a good distinction and categorizes at least one general tendency that I notice between. I tend to be more on the ‘continental side’ of things, I suppose, but I wouldn’t call my self a continental philosopher; but neither analytic. I suppose most would categorize my writing with the continentals though. There is a contingent of philosophers, some french guys it seems, who are attempting to bridge the gap, so to speak. I am in this camp (but I’m not French). Yet despite what may constitute actual definers of the camps, I think the distinction was more instigated by the continentals, because they are attempting to situate actual experience (if we can forego the discussion about what experience means or is, for now), the actual situation of being human, including in some cases the oddity of coming upon and or relying traditional lineages of ideas, and the divergence occurred due to the inefficiency and inadequacy of the usual analytical-methodological pieces-of -puzzle way. Nevertheless; there are a few who are attempting to take seriously and offer ways to dissolve this distinction. I for one think it is an anachronistic distinction. That is, if one can understand both, then there is no distinction but an analytical one. (isn’t that ironic?). I would say Witt-I on the analytic side, Witt-II on the continental one, approximately. Well, merge or not, it would be nice if continentalists got a bit more clear and rigorous, and if analytics got a bit more relevant to society. Again, approximately, on the continental side. No, they didn’t write abstrusely, but they didn’t really engage in a lot of argument making, and their focus was definitely social-political. Indeed. But there is a lot to “mock” about Derrida, in my opinion, and it still isn’t clear to me what the hell Heidegger was talking about. And I’ve tried. Interesting. I would probably put both Wittgensteins more on the analytic side, though the older Wittgenstein less so. And, whether or not one things aesthetics is still part of philosophy of not, it’s interesting that the split between tonal and atonal (especially serial) music happened at about the same time, and serialism was more seriously a practice of continental musicians. as far as analogies go, it is one of the least informative I’ve come across in years. Seriously, what the heck?